She absolutely killed them. Take nothing away from stable-mates Melody Belle (Commands) and Avantage (Fastnet Rock) who won the two previous editions of the $1m Karaka Million (Restricted Listed, 1200m) but Probabeel (2 f Savabeel – Far Fetched, by Pins) could have surpassed them in completing a hat-trick for Te Akau Racing on Saturday evening at Ellerslie. A race described by Racing Minister Winston Peters as ‘going from strength to strength’, the Karaka Million was instigated by Sir Peter Vela, for New Zealand Bloodstock sales’ graduates, and first contested in 2008. Both Melody Belle and Avantage were named Champion Two-Year-Old, with Melody Belle now the winner of three Group One races and Avantage also a Group One winner, so Probabeel has work ahead to frank their records but she clearly has the talent to. Flawless in her preliminary the superiority of Probabeel, after drawing the outside gate (14), to leave her rivals cold with a devastating finish wide on the track was something to behold – winning by two and three-quarter lengths. At the rear and wide before pressing forward to 10that the 800m, Probabeel stood the leader nine lengths at the 600m, peeled to the outside of her stable-mates Yourdeel (Dundeel) and Aotea Lad (Savabeel) on straightening and powered home to win easing down. 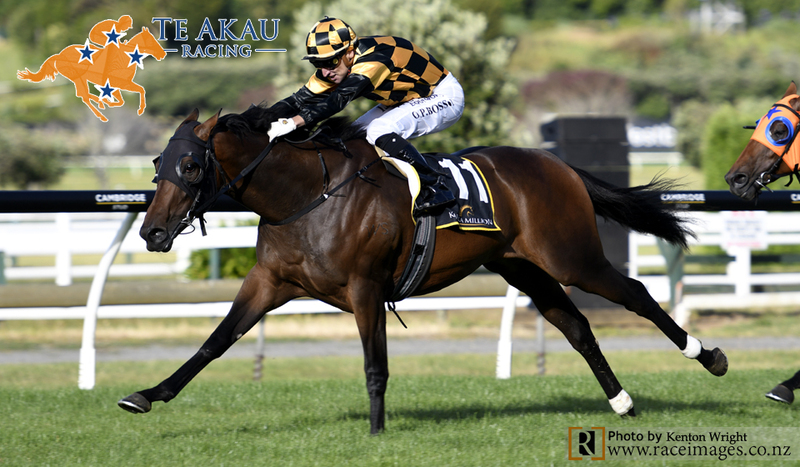 In his first season as sole trainer at Te Akau Racing, Jamie Richards claimed the trifecta with Aotea Lad comfortably holding down second and Yourdeel fighting hard to dead-heat for third. As second favourite, Probabeel returned $4.00 & $1.70 on the NZ TAB tote, running the 1200 metres in 1.09.9 and last 600m in about 33.5. “It’s just such a massive team effort,” Richards said. “I’m only the name in the book and we’ve got a huge support crew around us. We’ve got five lovely young kids leading the horses in and a great senior staff team around us. “It’s a big buzz and a bit of relief to be honest. It’s awesome for Brendan and Jo Lindsay, and Henry Plumptre. David (Ellis) bought this filly last year for them and they’re a pretty important part of our industry and as Dave says, the most exciting thing that’s happened to our industry in a long time (having bought Cambridge Stud). “Firstly, and most importantly, it’s a credit to the horses that David buys. That’s where it’s won and lost, and the sale ring is the winning post in our book and we’re really looking forward to (the Karaka sales) next week. “And it’s a credit to all the staff and the systems we’ve got in place. “We were reasonably confident before the barrier draw and then our best three chances drew outside of 11, so that didn’t make things easy, but there was good tempo and they were able to overcome it. And all five of these horses have got the ability and hopefully a bit of quality about them to train on. Asked when he first indentified the ability possessed by Probabeel, Richards said: “We went to the Te Teko trials in August, and Mark Walker was home from Singapore, and she came from last to run second and Mark said to me: “I haven’t seen a horse trial that good since King’s Chapel”, so we’ve known for a little while. “She’s a big scopey filly and nowhere near wound up yet. The future is very exciting. “The draw was a little bit tricky, but we had confidence in the man on board and obviously he’s a massive part of our stable. For him to get down to 54.5kgs, after celebrating a little boy (Max) with Emily through the week was a huge effort. On hand to witness the victory, Te Akau Stud equine manager Enzo Di Leoni was thrilled with the result. Having won the race aboard Melody Belle in 2017, and Avantage last year, rider Opie Bosson, Federer-cool, again got the job done with seemingly consummate ease. In unrivalled scenes at Ellerslie, Bosson returned to scale aboard the winner to chants from the Boys Get Syndicate that had invested a substantial sum on Probabeel. “It’s capped a super week and I’m so proud of Emily and Max,” Bosson said. “We managed to get in, one off, half way through the race and she just travelled beautifully. I had the right horses in front of me to take me into the race and geez she’s just got a turn of foot this filly and she’ll get better and better as a three-year-old. “She’s such a laidback filly and you wouldn’t think she was a two-year-old cantering to the start, but once she turns the gears on there’s a lot of power there. Owned by Brendan Lindsay MNZM & Jo Lindsay at Cambridge Stud, Probabeel was purchased as a yearling by David Ellis for $380,000, from the draft of Waikato Stud, at the Karaka Book 1 Sale last year. “It’s an absolute thrill to win this race for Brendan and Jo,” Ellis said. “They’re doing an amazing job at Cambridge Stud. They cemented their holding in the industry when buying the time-honoured nursery from Sir Patrick and Justine, Lady Hogan, and it shows their passion for the racing industry and that they’re in it for the long haul. It really is fantastic. “She was a beautiful yearling and to see Jamie trifecta the race is just an amazing achievement. We are all very proud and very emotional. Jamie is a young guy, still in his twenties, and it just shows if you’re young and want to dedicate yourself to the job and you’ve got some ability, prepared to really work hard, then the sky’s the limit. “It’s a great result for our whole breeding industry. “And also winning today with the colt (Equinox) at Trentham, I think was our eighth two-year-old winner and we’re still in January, and none of these horses have had any pressure on them. “It shows we’ve got a really good team buying these horses. We all work well together and we all work very hard. We been spend weeks doing inspections and by Friday night each week we’d go to bed absolutely exhausted. But, all that hard work is paying off and the owners are getting the rewards. “It’s incredible too for Opie, who is such an important part of our team. He got down to 54.5kgs at 9 o’clock this morning and didn’t even need to have a sweat this afternoon. I’m so proud of him. He’s worked really hard in our gym and he’s a true champion. He’s got so much ability, so much experience, and pressure doesn’t worry him. He was 14 years old when he first came to work for me and he came as a very shy young guy, but he’s made it and I’m just so proud of him. “Opie has been a massive help to Jamie and he’s a big part in the success of our stable. And James McDonald, who ran second, he rode a beautiful race on Aotea Lad, had him one off the fence after 300m and Aotea Lad went a fantastic race, as did Yourdeel. At the time of purchase, Waikato Stud boss Mark Chittick said: “She’s a sensational type of filly, with a beautiful pedigree and there is so much depth in this family. She was extremely well bought by Te Akau. I’m rapt the filly will go there and get every opportunity”. Probabeel was strapped by Teina Walters.